Is Bipolar Disorder a Thing? "So, am I depressed, or Bipolar, or what? 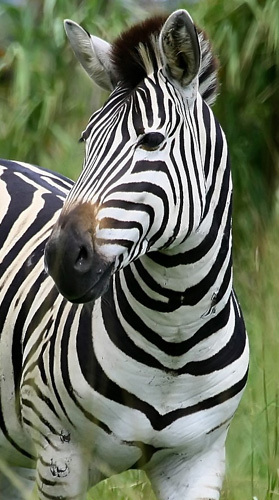 When you have to diagnose a client with lots of depressive symptoms and a few, brief manic symptoms, you can be faced with a zebra riddle: is this a mild case of bipolar disorder? Or just a depressed person who gets very, very energetic when their mood improves ? James Phelps, MD posts to the Psychiatric Times to suggest the problem may lay in the categories themselves. In a review of studies done with different definitions of hypomania (symptoms lasting at least four days… or three… or possibly two…) Phelps found hypomanic symptoms occur at lower and lower frequencies until they vanish altogether. He suggests Bipolar Disorder isn’t a ‘thing’, like a broken arm. Rather, he proposes it is a range along a spectrum of symptom intensity, the way doctors diagnose hypertension when their patient’s blood pressure gets up around 140/90. What to do? Dump the existing diagnoses? Start over by rating symptoms and personality traits on empirically-based scales? It’s true that a switch to research-based constructs would bring us all closer to the reality we can know and measure. The downside is that it would produce chaos during the conversion. To know one’s diagnosis is a fundamental client right – how long would it take to explain diagnoses like, “5-2-6-2-1-7-8”? How would we file and reference the research on extinct disorders? Where will Borderline Personality Disorder support groups meet if we declare there’s no such thing? To overturn established systems, one has to counter massive inertia. American therapists of a certain age will remember how the U.S. didn’t convert to the metric system in the 1970s – and it had a 200-year track record. Phelps suggests we contain the collateral damage by taking a cue from physicists. They’ve understood for years that light sometimes acts like a particle and sometimes like a wave. They’ve conducted useful research (and kept their heads from exploding) by using the most appropriate model for the problem they face. This “complementarity” principle means we can be more empirical without bewildering clients. For research, we’d use the ‘wave’ model, where it’s understood that ‘major depression’ and ‘bipolar’ mark points on a curve measuring the length and intensity of manic symptoms. When talking to clients, we’d use the ‘particle’ model, where we’d speak as though those conditions were as different as asthma and a hangnail. Would we lose specificity? Not enough to leave our clients uninformed. After all, even if Bipolar Disorder isn’t a ‘thing’, it shouldn’t take a psychology degree to get treatment.